It was just the other day we told you about The Hallmark Channel adding an extra hour of Happy Days, now we have even more good news! 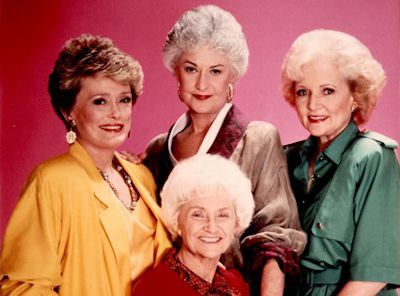 Beginning this Monday (January 21, 2013), the Hallmark Channel is removing the 8-10am episode of Home & Family and will replace it with two hours of The Golden Girls! As a result, now the original talk show block is only from 10am-1pm with Home & Family from 10am-12pm and Marie at noon -- with encores completely gone. But wait, there's even more good news! We get an extra hour each of recently added, new to the schedule sitcoms Happy Days and The Brady Bunch! Where will this extra hour each air? They will air weekdays from 4:00pm-6:00pm, with Happy Days in the 4pm hour and The Brady Bunch in the 5pm hour, both will replace The Golden Girls in the block. If you're keeping score, it's all Happy Days and The Brady Bunch now from 1pm-10pm. Happy Days weekdays from 1-5pm & Mon-Thurs 8-10pm and The Brady Bunch weekdays from 5-8pm. Wow! As we expected, both sitcoms have been doing pretty well for them so far after a little over 2 weeks of airing on the network. Both comedies are also on other networks (Happy Days on INSP and The Hub, The Brady Bunch on INSP and MeTV), but as not as featured as they are on Hallmark. Will this schedule last for Hallmark? We hope so, but it is promising after 2 weeks! Stay with us for continued updates! For the week of January 21-25, 2013, we have many current sitcom stars and past sitcom stars on TV talk shows! All times listed are Eastern. So get your DVR's (or whatever you use) ready! Ready? Here is all what you need to know for the coming week! Jamie Foxx (The Jamie Foxx Show) - Watch Jamie on The Late Show with David Letterman at 11:35pm on CBS. Sally Field (Gidget/The Flyning Nun) - Sally appears on The Tonight Show with Jay Leno at 11:35pm on NBC. Busy Philipps (Cougar Town) - Busy visits Conan at 11pm on TBS. NeNe Leakes (The New Normal) - NeNe is a guest on a repeat of LIVE! with Kelly and Michael, so check your listings. Valerie Harper (Rhoda/The Mary Tyler Moore Show/Valerie's Family) - Valerie stops by ABC's Good Morning America between 7-9am. Julie Bowen (Modern Family) - Catch Julie on Jimmy Kimmel Live! at 11:35pm on ABC. Angela Kinsey (The Office) - Angela discusses her path to acting and the upcoming series finale of The Office on Marie on Hallmark Channel at 12pm. Kristen Johnston (The Exes/3rd Rock from the Sun) - Kristen is a guest on The Wendy Williams Show at 12am on BET or on your local stations. She will also be on Watch What Happens: Live at 11pm on Bravo. Michael Strahan (Brothers) - Watch Michael on a repeat of The Late Show with David Letterman at 11:35pm on CBS. Michael also joins the Good Morning America team on ABC in the 8am hour. Allison Williams (Girls) - Allison appears on Jimmy Kimmel Live! at 11:35pm on ABC. Sally Field (Gidget/The Flying Nun) - Sally visits The Colbert Report at 11:30pm on Comedy Central. Jenna Elfman (1600 Penn/Courting Alex/Dharma & Greg) - Jenna is part of the guest panel on Chelsea Lately on E! at 11pm. Kathy Griffin (Suddenly Susan) - Kathy stops by Conan at 11pm on TBS. Kim Coles (Living Single) - Kim is a guest co-host on The Talk on CBS at 2pm ET/1pm CT-PT. Christine Baranksi (Cybill/Happy Family) - Christine appears on LIVE! with Kelly and Michael, so check your listings. Tracy Morgan (30 Rock/The Tracy Morgan Show) - Tracy chats with the ladies of The View on ABC at 11am ET/10am CT-PT. Tom Hanks (Bosom Buddies) - Catch Tom on a repeat of The Late Late Show with Craig Ferguson at 12:37am on CBS. Jennifer Lawrence (The Bill Engvall Show) - Jennifer appears on LIVE! with Kelly and Michael, so check your listings. Anthony Anderson (All About the Andersons/The Bernie Mac Show) - Anthony is a guest on LIVE! with Kelly and Michael, so check your listings. Cedric the Entertainer (The Soul Man/The Steve Harvey Show) - Cedric visits The Ellen DeGeneres Show, so check listings. Jenna Fischer (The Office) - Jenna chats on The Jeff Probst show, so check your local listings. Patrick Duffy (Step by Step) - Patrick chats with the ladies of The View on ABC at 11am ET/10am CT-PT. Katey Sagal (Married with Children/8 Simple Rules) - Katey appears on a repeat of Last Call with Carson Daly at 1:35am on NBC. Lena Dunham (Girls) - Lena is a guest on LIVE! with Kelly and Michael, so check your listings.